Oil production in Ghana has not met high expectations following inconsistency in levels. According to Tullow a recent water injection pump failure on the floating production, storage and offloading( FPSO) , which will be replaced before year-end, and a decision to extend the planned maintenance shutdown period will however have a short term impact on production in the second half of 2013. “Production from the field is now expected to average around 95,000 bopd for the full year,” it said. Meanwhile, overall, Tullow says the Jubilee field which is its flagship offshore operated asset contributing around 40% to the Group’s overall production. “Since late 2012, field production has steadily increased and is currently at a rate of around 110,000 bopd. The FPSO Kwame Nkrumah, which serves the Jubilee field, continues to perform well with a very low rate of unplanned shut-downs and an excellent safety and environmental record,” it indicates. Tullow notes that testing of the FPSO facilities was completed in March 2013 and indicates an oil system capacity in excess of 125,000 bopd. 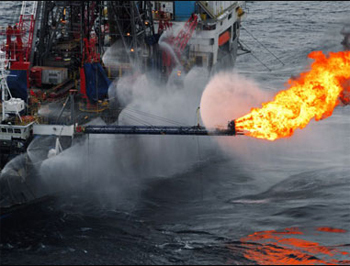 According to Tullow, this test combined with the work on the gas handling constraints on the FPSO and the decision to drill an additional gas injection well, both of which will be completed in the fourth quarter of 2013, are expected to result in a 2013 exit production rate of over 120,000 bopd. “Tullow and partners also continue to monitor the gas export project in Ghana which is currently expected to start-up next year,” it added. The oil producer says its financial results are in line with market expectations. Production 14% to 88,600 boepd, first half revenue up 15% to $1.3 billion and operating cash flow before working capital movements exceeds $1 billion for the first half. Oil production in Ghana started December 2012.